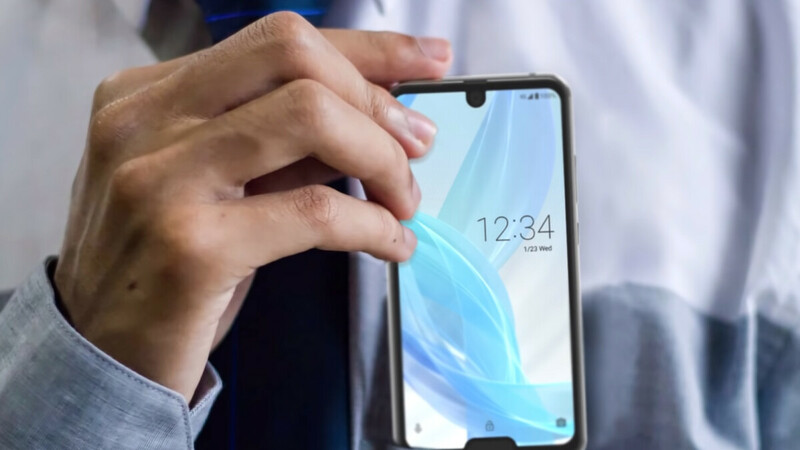 People have been joking about a double notched smartphone ever since the first models with the notorious display cutout were announced. It was only a matter of time before someone decided that a notch on the bottom is not as bad as it sounds, and now our worst fears have manifested into reality. The device is called the AQUOS R2 compact and is coming from Sharp, The Verge lets us know. If the design makes you look the other way, don’t worry, chances are you’ll never lay your eyes on one in the flesh, as its release will be limited to Japan and possibly other close-by countries. Still, though, such an unusual device is worth taking a closer look at, no? As is tradition, the top notch is housing the front facing camera and in the R2 compact it’s a minimalist one similar to the Essential Phone's. Meanwhile, the bottom one is needed because Sharp wanted to keep the front mounted fingerprint sensor but add more screen real estate to the device. While the asymmetrical notches make us shudder, we can’t blame Sharp for the decision to add some more pixels to the front panel, as the R2 compact has an appropriately small 5.2-inch display. The size doesn’t stop the display from having an impressive 2280x1080 resolution and offers not only 120 Hz touch-sampling, but a 120 Hz refresh rate as well (Sharp is likely the provider for the Razer Phone 2 displays that have the same refresh rate). Inside you can find the Snapdragon 845 system chip paired with 4 GB of RAM and 64 GB of storage, all of that running Android 9. The battery is a smallish 2500mAh one despite the device being on the thicker side at 9.3 mm (iPhone XS is 7.7 mm). With manufacturers offering pretty much no small form factor high-end phones, leaving this market segment rather empty, can we see a similar device coming to the west? With the latest in-display fingerprint technologies and edge-to-edge displays, we hope that the time for the small flagship phone to come back is near. We don’t mind waiting as long as we can avoid the dreaded second notch. you get not one, but two notches and a chin for probably fraction of what iphone costs, and iphone only gives you one notch - apple is greedy! wheres my second notch, apple? Even samsung has a chin, why cant apple? They should come up with some extra feature , like putting some gestures in the bottom corners. With an Amoled screen , it would be that ugly, and the notch would be house a good stereo . The notches should be symmetrical in order to look good. And if a notch is present on the chin, there should not be a chin. Utter failure. That's exactly what I was thinking. If you're gonna double notch a phone, make it symmetrical and do not under any circumstance also give it a chin. Absolute design fail. Oh dear God no. Why?! Just why?! Sharp: "Be original". Apple: "We will copy the original again, sometime." At this point I think companies are just trolling us. Doesn't matter, one notch is as bad as two, three. Not matter the crap, they all sink to the bottom. Okay .. this isn't funny anymore..! I believe the Pixel was the first to have multiple notches. Oh my bad that will be fixed with a software update. Sharp designers have always been first on trendy things that's why apple also copy their phones. Love it or hate it, I am 100% sure that goatee will be adapted by manufacturers in the near future. And this is why Sharp phones aren't and will never be popular in the US. Two notches are just as bad as one. If you can justify one you have to be able to justify two. 1. Sharp is the father of bezeless and they will be referred to as such. 2. If they removed the notch at the top it might have been different and kinda more appealing.